Time traveler’s business partner is the King’s mistress. A floundering San Francisco stand-up comedian who goes looking for free rent and ends up in seventeenth-century London two weeks before an outbreak of the Black Plague. Elliot Vail is a floundering San Francisco stand-up comedian who will do anything for a cheap place to live. So when strange little Edward Bockman offers him free rent in exchange for some odd dos and don'ts, Elliot thinks his luck is about to change. After all, despite Bockman's overactive imagination, head-to-toe Robin Hood costume and locked bedroom door, he seems nice enough. Little does Elliot know that his new landlord is time-traveling to trysts with an ex-mistress of England's King Charles II . . . and that he'll soon be expected to rescue Bockman from a seventeenth-century prison and a deadly outbreak of the Black Plague. 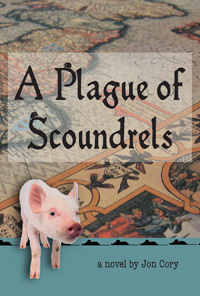 Jon Cory’s humorous and romantic debut novel takes readers on a romp through London and the rural English countryside. Along the way, we meet a cast of scoundrels including petty thieves Tom Major and Tom Minor, Grundel the local hangman, and the villainous Frenchman Le Mieux. Then of course there’s the beautiful maidservant Lilly, who will lead Elliot Vail on the adventure of a lifetime. But will love be enough to keep Elliot in Plague-ridden London, or will he return to modern life in twenty-first-century San Francisco? Copyright © 2013 Jon Cory. All rights reserved.